When paper quilling took over the arts and craft community a few years back, Drizzela was a part of it. And today, she makes gorgeous quilled earrings, and you can wear ’em to flaunt ’em. Quilling is a unique way of presenting art wherein you take a sheet of paper and bend it in curves and waves to give it a unique look. Drizzela D’Souza, a content writer at Yellow Seed had enrolled herself in classes back in college to learn the basics of quilling. And from there, she began creating gorgeous accessories like earrings, rings, pendants and more. 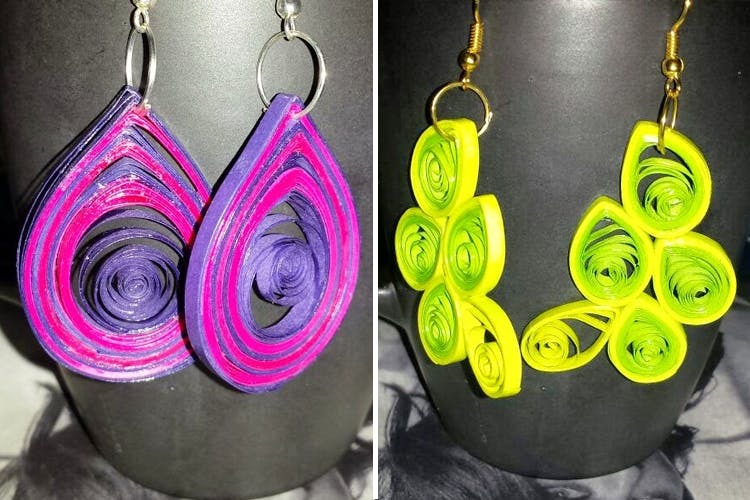 Her love for creating unique things and a hobby of quilling led her to sell these ornaments generally at various college fests and sales. Though she still continues to quill and engage in art, she only makes earrings now as she juggles her hobby with a full-time job. The earrings are absolutely beautiful, and kitschy. All of them are handmade and quilled by Drizzela. You can find long earrings, jhumkas and even studs. She tell us, she also makes cards if requested. You can buy these lovely earrings by getting in touch with her directly. A pair of studs cost INR 30, jhumkas come for INR 50 and the collection goes up to INR 80. Especially popular with the college-going girls, these earrings are perfect for college festivals and are super chic. The festival season is upon us and we think these earrings go perfectly well with ethnic and even western attire. To get in touch with her, contact her on 9930116802.